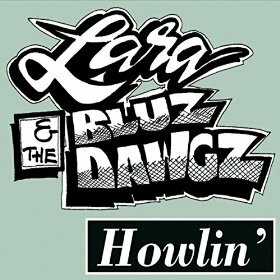 I just received the newest release, Howlin', from Lara & The Bluz Dawgz and it's a mover. Opening with boogie woogie track, Uh Huh, Lara Germony leads on vocals on this piano fueled track. Gan Nadasdi knows his was around the keyboard, and a rich sax solo from Reggie Murray adds sass. Al Rowe rips a few blistering riffs on guitar and Gregg Germony on bass and Ray Gonzales are tight on bottom. Flat Line has a light funky beat with healthy guitar lead and a soulful sax solo. Lara is a well suited lead singer for this type of band with it's fluid leads and I particularly like Rowe and Murray's exchange fueled by G. Germony and Gonzales. I Wonder is a soulful ballad with a nice guitar intro by Rowe. This band really has a nice balance between sax and guitar soloing and Nadasdi adds just the right amount of keyboard. Another Boogie track, Wearin Me Out has a nice driving bass line giving Lara plenty of space to sing. Murray again shows his sax prowess and Rowe flexes his guitar muscle. Very nice! R&B style blues, T-Dawg, has a real nice feel (think Thrill Is Gone). Again Murray and Rowe are nicely balanced on soloing with Nadasdi providing a solid bed of piano. A nice bass line by Gregg and straight up drums by Gonzales gives the track more oomph. Don't Mess With My Baby has an easy R&B feel with a lot of radio qualities. Smooth execution, a good hook and clean guitar riffs are the trick here. Another easy jazz like composition, Love Me Tonight, has an almost Steeley Dan feel. Rowe's guitar work on this track is particularly clean and Murray's sax work supple. Lara has a nicely controlled voice that floats pleasantly atop the track. Rocker, I'm Over It, almost enters 2 step territory with Gregg and Nadasdi setting the pace. Rowe's guitar work even gets a country flare to it by the end of the track. Returning to the ballading, Lara belts out Say Goodbye, with authority, and the rich sax work of Murray cushions her ride. Ongoing musical dialog by Nadasdi adds significant structure and Rowe buttons it up with a solid outro. A swinging blues, Love Of Mine, has a real cool bass line by Gregg and Nadasdi plays a really nice electric key solo. Murray shows his chops on this track as well giving the track a bit more of a jazzy feel. Gregg lays down a cool bass line on Shadow Groovin and Lara sings right in the groove. Rowe again steps out of the shadows with some very nicely articulated finger work and Murray give the track an almost Marvin Gaye feel within his jazz lines. Very nice. Wrapping the release is blues rocker and title track, Howlin'. With it's New Orleans flavor, reinforced by Nadasdi's keyboard work and Gonzales' drumming, this is a hot number to wrap up the release.